I’ve been drawing all my life. I studied sculpture and the drawings come out of sculpture. Drawing is what I do. 'Ghostwall'. 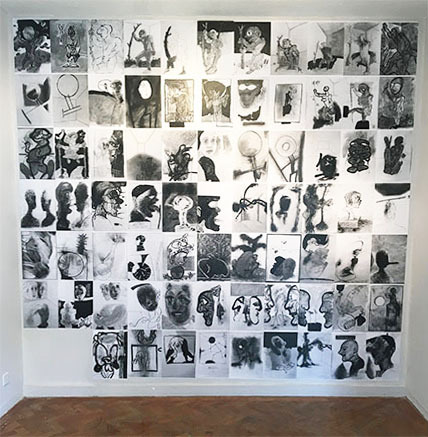 75 drawings on an 11ft wide x 10ft high wall. 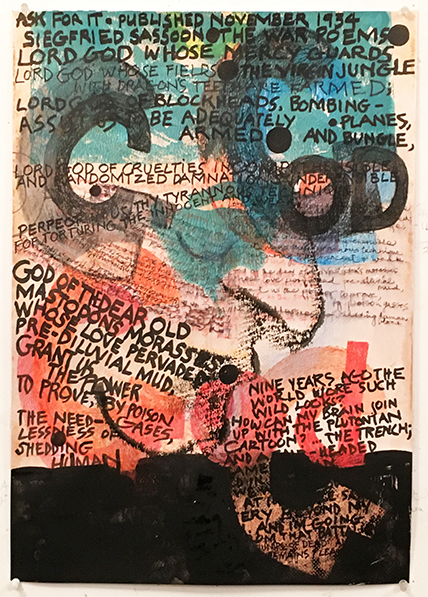 Exhibition at Phoenix Brighton, July 2017. In 2016 a folder containing 75 of my Near Death Series drawings disappeared from my studio when the open door was left unguarded. The 75 vanished drawings, which were fortunately on my website, have been reproduced as black & white photocopies for Loss & Opportunity 2017. The wall based installation called OUT OF THE STUDIO: GHOSTWALL reaches from floor to ceiling in the South Gallery, Phoenix Brighton. The originals are gone, and these implacable, wallpapered photocopies make an ironic statement about loss. The GHOSTWALL was destroyed in the act of its removal at the end of July.